So far this Autumn only one Twite has been seen at the Heysham feeding area. In previous years the first arrivals have been around mid-October. There have been no sightings from the Heysham Twite colour ringing over the last two seasons, using numeric engraved rings, in which the engraved numbers could be determined. Feedback has been that it has been frustrating trying to read these numeric engravings. Therefore a new ring scheme has been introduced. The Right leg combination of Pale Blue (site identification colour) above BTO Metal is to be retained. The Left leg combination will now consist of two single colour rings, providing individual identification, from a stock of twelve colours. The right leg combination may be reversed i.e. Metal above Pale Blue, should the left leg colour combinations be exhausted. 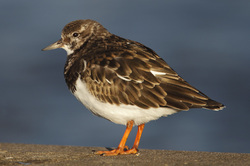 - generate some information on wintering sites and distribution of wintering Turnstone in the northwest of England or further afield. 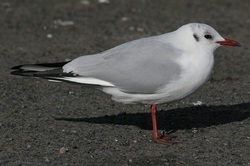 - attempt to find out what the turnover of the birds wintering at Fleetwood Marine Lakes is. - where are they coming from to roost/forage at the site. - measure winter site fidelity and implications of disturbance if they show high winter site fidelity. - generate re-sightings to look at migration routes. - try and ascertain whether there are any relationships between wintering areas and breeding areas. - possibly measure phenology if we can catch them over a number of years. The birds will be trapped at a feeding station at Fleetwood Marine Lakes and on the right leg the birds will have a metal BTO ring above the knee (on the tibia), a green colour ring below the knee (on the tarsus) and on the left leg above the knee a black leg flag inscribed with white lettering. The aim is to try and mark up to a 100 birds each winter for five years. Fylde Ringing Group would be grateful if Fylde Bird Club members could report any sightings of these birds to nwturnstones@gmail.com. A full sightings history will be sent to anybody reporting a colour marked bird. Click here to download a newsletter detailing the colour ringing of Black-headed Gulls in the North-west of England.